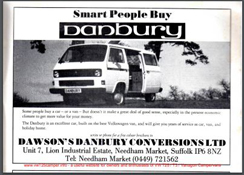 Added some downloads to the VW T25 / T3 Danbury Downloads Page. 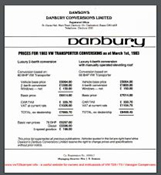 March 1983 Pricelist for the 2 and 4 berth luxury VW T25 camper models. Feb 1992 Magazine Article about the sad demise of the Dawsons Danbury company.